As a means of self-healing and in the hands of experienced therapists there are unsuspected possibilities of a gentle and yet very effective approach for emotional and physical problems of any kind. Another step on the road to evidence-based therapy reached the psychologist Dawson Church by the successful submission of a peer-study about EFT at the APA (American Psychological Association). This work and a further 50 published studies highlight highlights in the scientific credibility of EFT. Already thousands of people have experienced relief from stress, which in ihnenals physical pain, mental disorders or even acute and chronic diseases manifested. 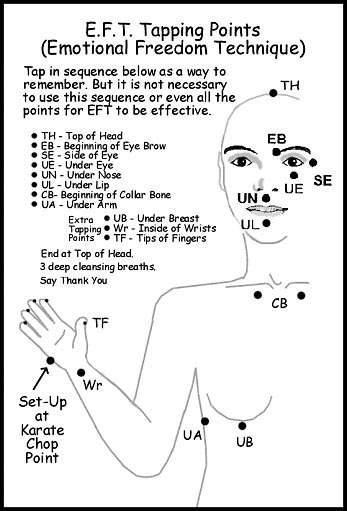 Simply put, it is in the technique “EFT” a kind of acupuncture, but with no needles are used. Instead, you stimulate meridian points defined by this easy taps on the body. In the hands of the professional user, this technique is a powerful tool for resolution of emotional disorders, phobias and even physical problems. Another important focus of EFT lies in the use of stabilizing a healthy soul in a healthy body. Here you can see mainly the application of the technique by the layman.